Any form of surgery is traumatic to the body, especially if you are put under general anesthesia. Depending on the type of surgery you receive, you may awaken to swelling, severe pain and possibly subcutaneous bleeding and other unpleasant symptoms. In certain cases, you may react to the anesthesia with nausea, vomiting, cognitive dysfunction and memory loss. In all cases, herbal remedies may be useful for helping you regain your sense of normalcy and speed the recovery of your body. Herbs can cause side effects and interfere with medications. Speak to a health practitioner familiar with their use for post-surgical conditions before using them. Ginger is possesses anti-inflammatory properties and is also a well-known remedy for the treatment of nausea and vomiting. Some people develop severe nausea and vomiting after surgery due to a reaction to the anesthesia or other pain-killing drugs administered. The University of Maryland Medical Center, or UMMC, cites research in which was ginger used to reduce post-surgical nausea and vomiting. In certain instances, women needed less nausea-relieving medications after surgery after taking 1 g of ginger root before the surgery as a preventative. Other research indicates ginger may cause nausea and vomiting, but anecdotal evidence indicates that the dose may be too high in that instance. Herbalists are aware that herbs can cause the same symptoms that they can prevent, and the way to manage them is through the size of the dose. Ginger can thin the blood, so it is not the best herb to take before an operation. However, under medical supervision, it may offer relief to those experiencing nausea and vomiting when administered after surgery. Tell your health practitioner and the surgical doctors if you take medicines for thinning the blood, and avoid using ginger unless under strict supervision. Quercetin is a potent flavonoid found in various fruits, vegetables, teas, wine and various herbs that helps reduce swelling and lymphedema -- the buildup of lymphatic fluids in the tissues -- as well as lowering the risk of developing cellulitis, or blood poisoning after surgery, according to the University of Maryland Medical Center. Take up to 1,000 mg of quercetin two to three times daily for the purposes of supplementation. Calendula comes from marigolds and is used both externally and internally to help heal wounds and ailments of the skin. Herbal calendula is available in liquids and ointments and is an excellent healing herb to disinfect and speed recovery of incisions. Calendula possesses antibacterial properties and reduces the risk of developing cellulitis, blood poisoning and MRSA infections after surgery, according to Andrew Chevallier in "Encyclopedia of Herbal Medicine." Calendula is also available as a homeopathic remedy, which is used to clean the blood of toxins and help repair the skin, according to homeopath Dr. William Boericke in the "Material Medica and Repertory." It is taken orally and should be prescribed by a homeopathic practitioner. Honey, though not specifically an herb, comes from a plant-based source and often acts like an herb on the body. It possesses numerous healing properties from various enzymes and antibacterial compounds that may prevent infection when applied topically after surgery, according to the book, "Herbs for Health and Healing." It helps incisions heal more rapidly. Do not use honey on an open wound. 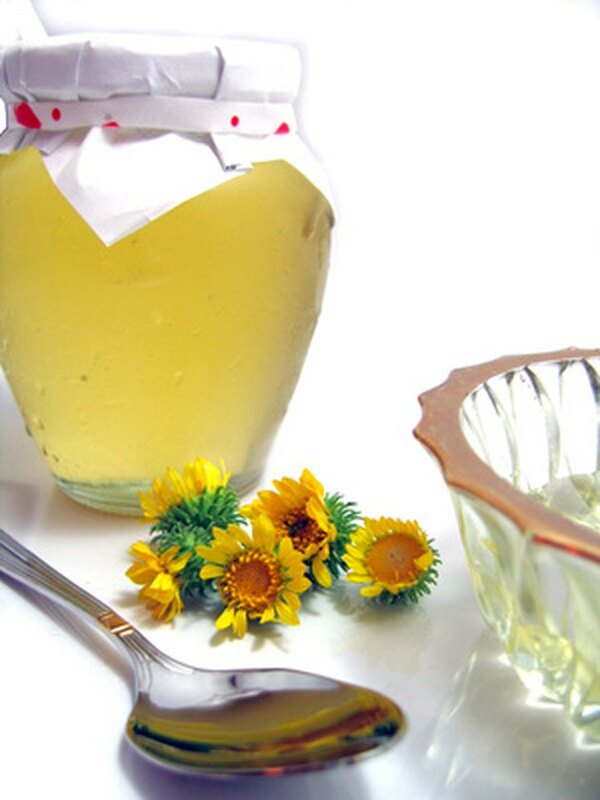 Honey can develop botulism spores and should be stored in the refrigerator until it is needed. Do not apply or feed honey to children younger than 1. Bromelain is an enzyme derived from pineapples that helps reduce inflammation and pain. It was approved by Germany's Commission E for use after ear, nose and throat surgery to help reduce inflammation of the sinuses, says the UMMC. Additionally, bromelain can be used post-surgically to reduce swelling and pain, speeding recovery. The German Commission E recommends 500 mg four times daily for the treatment of injuries, which includes surgical trauma. Take bromelain on an empty stomach. Bromelain can thin the blood. If you take blood-thinning medicines, consult your health practitioner before using it. Is Ginger Tea Good for the Throat?